When Tysons Reporter posted polls on Facebook and on our website last week asking whether Tysons was a fun place to go out at night, the answers were… not great for the area. A notable bright spot, according to several Facebook commenters said, was the Tysons Biergarten. 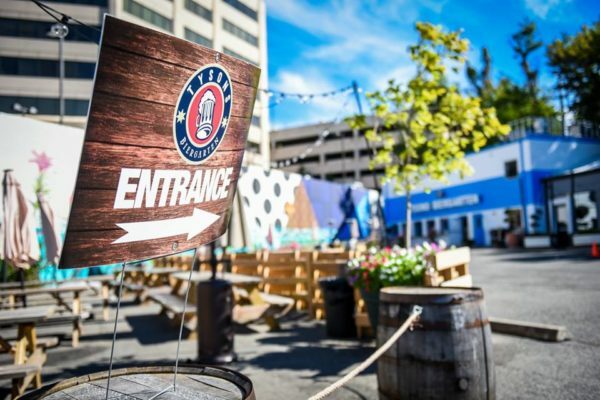 Commenters described the Biergarten as the kind of casual and affordable late-night activities the area needed more of, so we reached out to Biergarten owner Matt Rofougaran to get his thoughts on the current state of local nightlife and how to make it better. Rofougaran was a managing partner with Washington, D.C. nightlife hotspots like Ultrabar for years and was eager to move that scene to where he grew up: Tysons. But when the Biergarten started two and a half years ago, Rofougaran said there local nightlife scene was scarce. Rofougaran said the late-night locales in the area catered to specific interests, like the now-closed international hookah bar Babalu and Iris Lounge, which catered to an older, wealthier crowd. Fast forward to today and Rofougaran says the nightlife scene has hardly improved. Tysons Biergarten and the nearby Greenhouse Bistro are two of the only thriving late-night spots in Tysons, but Rofougaran said their popularity is mainly because they’re one of the few options available, not an indicator of market interest for late-night activities. Andrew Taherzadeh, digital communications manager for Fairfax County Economic Development Authority, reiterated that Greenhouse is a popular hub of activity on Friday or Saturday evenings, but that aside he admitted that local late-night entertainment is sparse. New late-night options are coming in with developments like The Boro, which will also bring with it more housing — crucial for making Tysons a more vibrant place at night and not just a daytime destination for workers. But Rofougaran says nightlife in Tysons faces an uphill battle against the more entrenched establishments in Arlington and the more lax alcohol laws in Washington, D.C. But like Taherzadeh and 56.2 percent of Tysons Reporter’s readership, Rofougaran said it’s going to get better.